What an amazing weekend we had at Around the Table! It exceeded my wildest expectations. Thank you so much to everyone who came along and threw themselves into the spirit of it. I've got so so much to tell you all, but first I want to let it all sink in, to digest it and to sleeeeep! 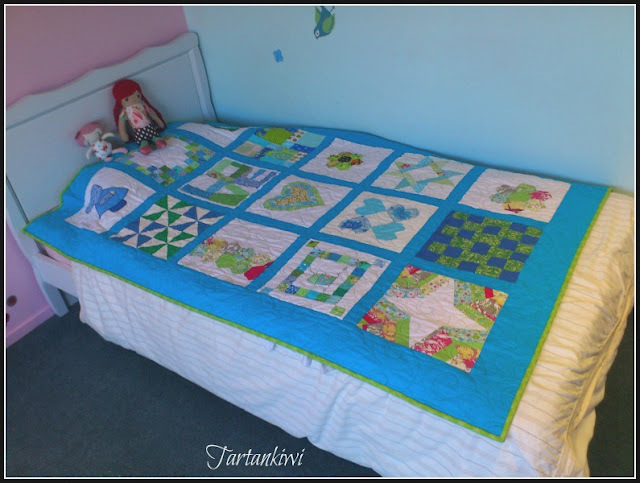 In the meantime I thought I'd show you this finished quilt which I handed over this weekend. 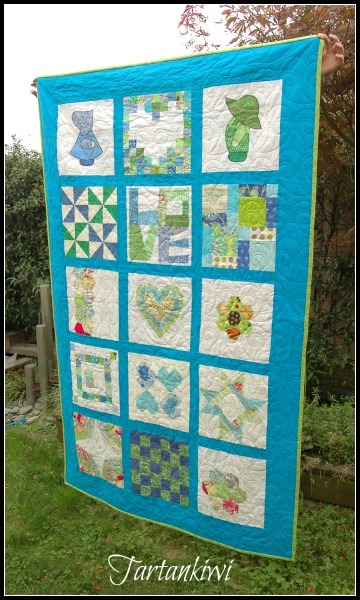 I gave you a sneak peak of a quilt top the other week and suggested that it was a very special quilt. You see, a while back I read this post on Sammy's (old) blog. I could totally relate to the sentiments expressed and decided that I wanted to do something for her... but what? I played with a few different ideas, but most of them just weren't right. Then I discussed it with Cat and we came up with a plan. Made by Sammy's blogging friends. To give her comfort and support in difficult times. Cat helped me to rally the troups. Leonie, Laura, Miriam, Deb, Cat, Treena, Leonie, Leeanne and Meghan answered our call. Then I sat and waited for the blocks to arrive. As they trickled in, I became more and more excited. People had really thought about why they were making these blocks. They were not only beautiful, but also thoughtful and heartfelt. I began to feel the pressure to bring them together as well as I could. 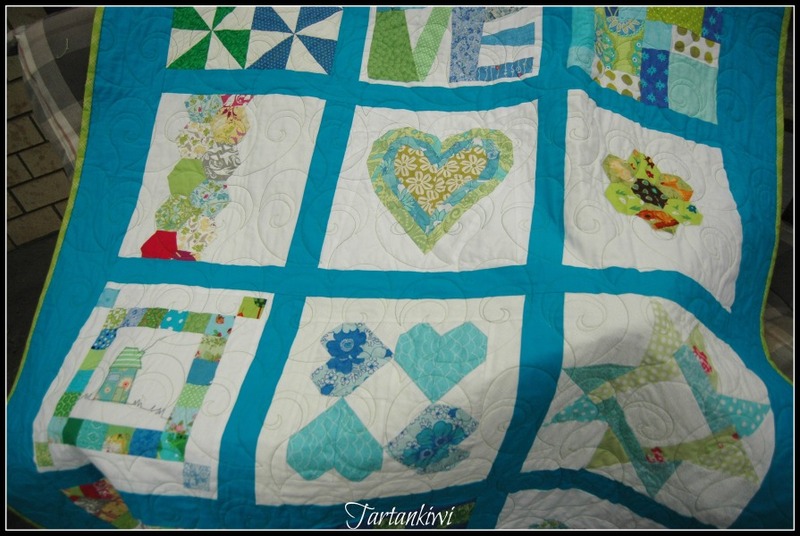 I have named this quilt The Bloggers Hug.The name originates from the back of the quilt. You see Cat had a whole lot of siggie blocks, made by people from all around the world. She had the idea to incorporate these into the quilt back and asked those contributing to the quilt to provide siggie blocks too. My initial reaction was "WHAAAT! ", followed closely by "HEEELP!" and "what on earth am I going to do with those in the timescale that I have?!!" But I took a deep breathe and told Cat to send them to me - I promised to do my best with them. 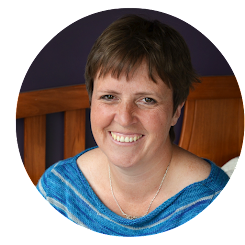 Once they arrived, I ignored them and quietly panicked to myself for a while, but slowly an idea took seed in the back of my mind. 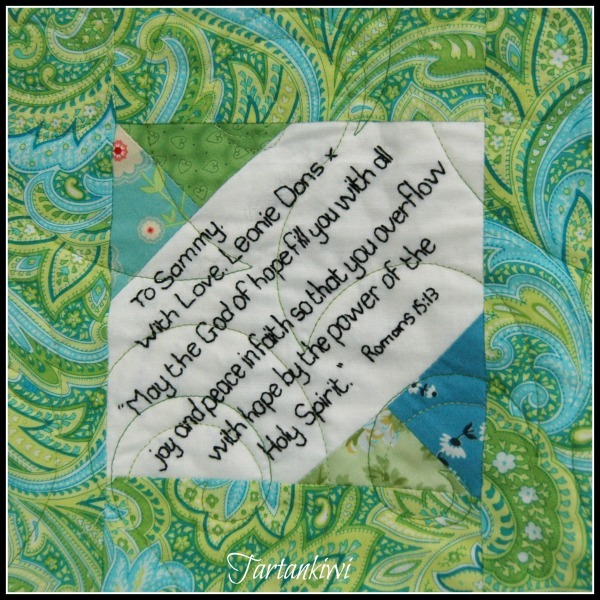 I decided to use them as a border (a sort of international hug from the blogging world) on the back of the quilt. 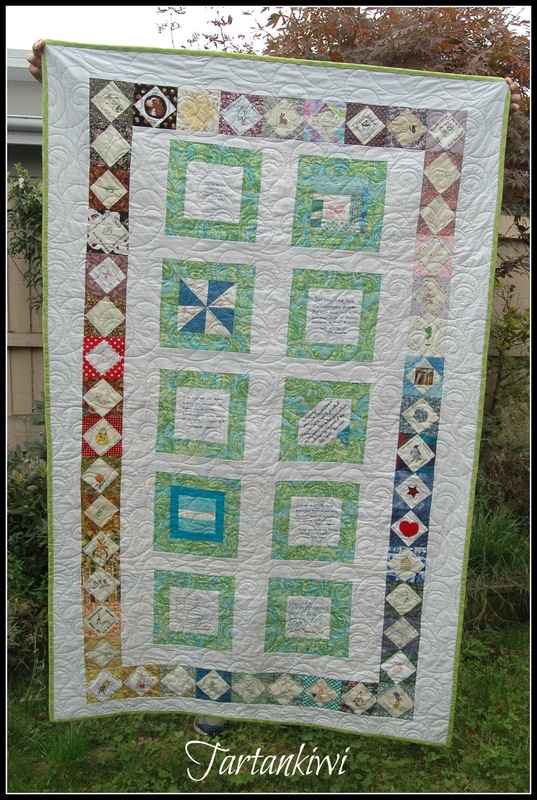 Inside the hug, I featured the siggie blocks of those who helped to create the quilt. I am really pleased how well it all turned out. The text on most of the personal siggie blocks is beautiful and very emotional. 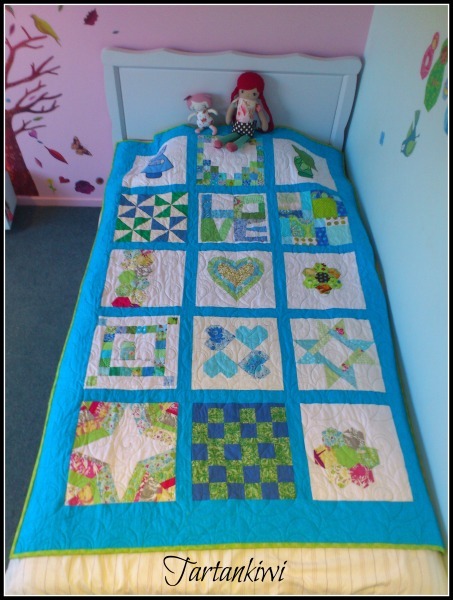 I was going to quilt this myself, but when one of the girls offered to have it professionally quilted, I considered the timescale, my very busy schedule and almost immediately said "yes please". 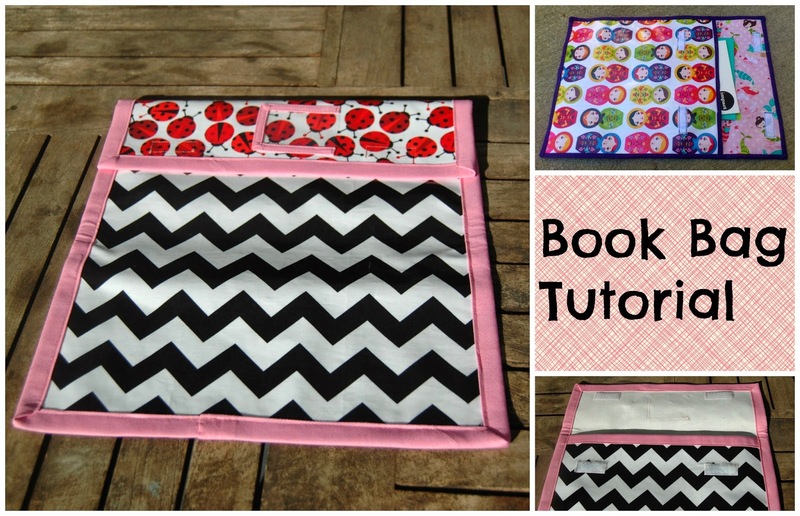 I'm so glad that I did as the quilting is amazing! I love the heart and koru motif. Dearest Sammy, please accept this gesture of love and support from your blogging friends. 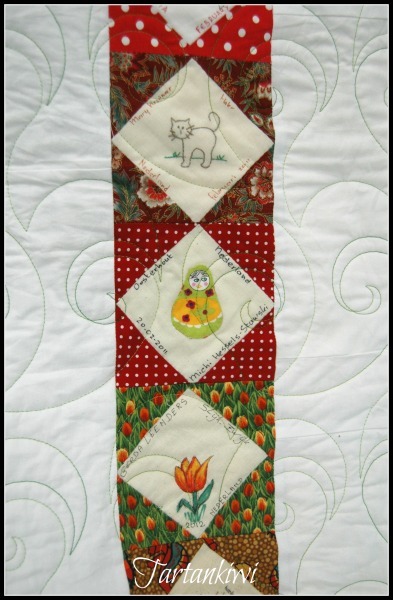 May this quilt make you smile even in the most difficult of times. I still can't believe that you girls did this for me. I am completely overwhelmed and thank you seems like such a hopeless way to express what it means to me. I have slept under it every night since I got it and it does feel like a giant hug. Things are tough for my dad right now and so I am going to take it over to him and wrap it round him while he sleeps. I can think of no better way to surround my parents with love when I can't physically be there. it was so beautiful. Great job girls. How amazingly thoughtful, beautiful and just plain wonderful. Such a great job! So amazing - love your heart and the heart of this blogging community. So so wonderful. Goosebumps much. You girls are just so KIND. Kindness is worth more than millions. 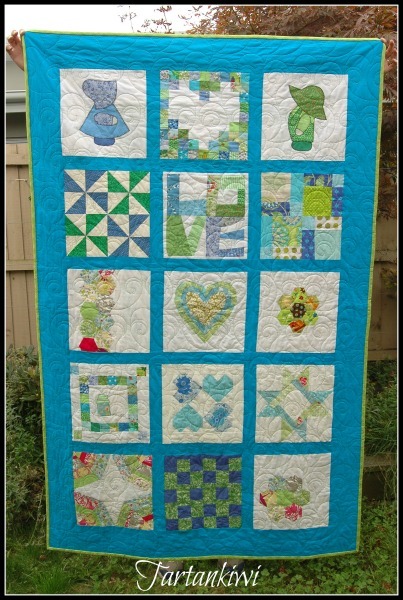 This is a priceless quilt. Absolutely stunning! Sammy is certainly one lovely lady who deserves that big hug! Ooo this is just amazing . What a beautiful gesture! !